Tell us about what a Sales and Services Assistant does at Traverse City Tourism. Basically what it comes down to is that I get to assist in creating great experiences and memories for folks! Pretty awesome job, right? I help make connections and assist in planning primarily with our social guests. Whether it be a wedding, family reunion or any social gathering I’m the person that can help make it happen. I also provide support services for our amazing sales and services team. 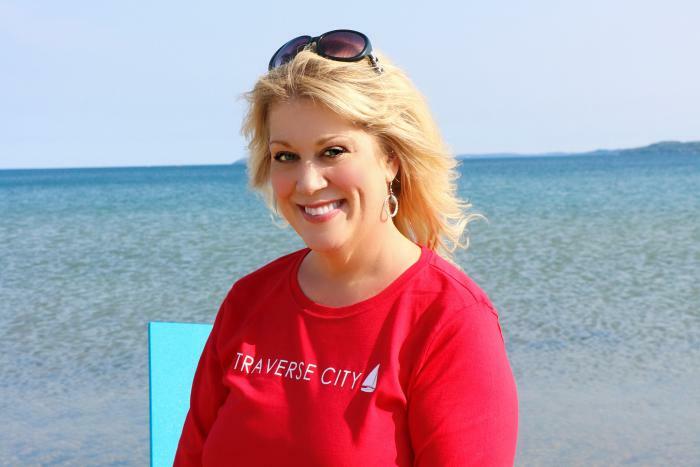 What did you do before working at Traverse City Tourism? I’ve been incredibly lucky since moving to Traverse City in 1992. And boy, there have been loads of changes in TC since that time! I initially landed with a terrific, inspiring creative group of people at Nielsen Design Group where I got to live in the wonderful world of branding, then spent some time with the remarkable team at McConnell and Associates in the world of advertising. Most recently I was employed with Venture North Funding and Development (sister company to the Traverse City Area Chamber of Commerce) where I assisted in the management and implementation of a $4+ Million access to capital program that helped with economic development in the area. I’ve truly been blessed to have been able to work for this beautiful area -- and with wonderful people -- these past 25 years. Simply put, the people. My coworkers are all so passionate about this area. Add in brains, creativity and a sense of fun and it’s just a perfect mix. Also, the actual “work” is just plain enjoyable. Getting to assist in being a part of people’s “Big Day” is such a humbling honor -- AND I get to share my love for this area. For me, it just doesn’t get any better really. What attractions, destinations, restaurants, do you favor in TC? Oh boy…where to start? I guess I would have to say I love all the little villages in the area. There are so many quirky festivals and quaint places up here. Also, I would have to add in Front Street. Downtown Traverse City will always hold a special place in my heart. Having worked downtown in all my years here I’ve seen a lot of changes. From the “old days” of meeting friends before work at Ray’s Coffee Shop, to today’s hip shopping and foodie scene, it’s just a remarkable place. Every day I run into friends --It’s just home really. 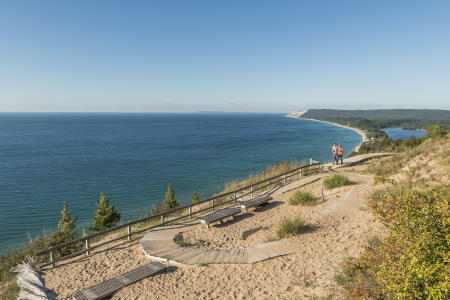 And I can’t forget to mention Sleeping Bear Dunes and Leelanau County! They are places I always suggest to folks visiting. The county is just a magical, beautiful place. The scenery, the water, the villages, the wineries…ahhhhh, no words. What is your favorite downtown lunch spot and why? I HAVE to pick? Not fair! Hmmm, I guess I have two really. Amical has always been my go-to place. It holds a special place in my heart as it was one of the places where I was “wooed”. The food is delicious and the atmosphere is just well, romantic! Also, Patisserie Aimee is another favorite. I love going there for lunch and for weekend dinners. It’s like stepping into Paris! It’s small, the food is so yummy and it also is my daughter’s favorite restaurant in TC. She loves the escargot. That’s a great question and it has a lot of answers. Most recently I have been in a position personally with first time visitors to the area. My S.O. is new to the area and we have had some folks visit that had never even been to Michigan, let alone Traverse City. It was terrific to get to experience this area through a new, fresh lens and to share all the amazingness this area offers. I guess the way to describe it that sums it up the best, is that it is just a very beautiful, happy place -- both in its scenery and with its people. This is an easy one! Get in our convertible on a sunny day with my S.O. and just drive. Maybe it’s a festival, a farmer’s market, a winery, a quaint village, The Blue Vase Book Exchange, a beach, an estate sale…. just go where the day takes you! The options are endless really. If you could wish for a celebrity sighting in Traverse City – who would you want to see? Colin Firth. Colin Firth. Colin Firth. Heart be still. Did I mention -- Colin Firth?!? I must say that I do like the very distinct seasons we experience here. 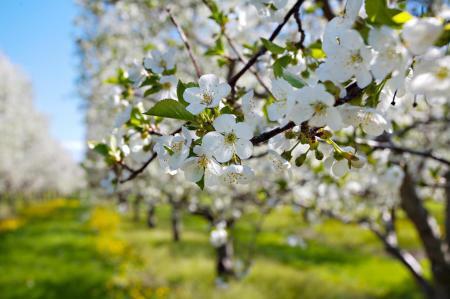 Our summers are glorious with the beaches and the Caribbean blue water, winter can be magical especially during the holidays, spring is beautiful with the cherry blossoms and fall is terrific with the colors and wineries. It’s like choosing a favorite child really -- they all have their lovely uniqueness. Describe a memorable Traverse City experience. I think the thing that is most memorable to me is all the family memories I’ve made since moving here. My grandparents so enjoyed coming here to visit and loved the Cherry Festival and The Blue Angels. I’m so grateful for those times we had as they have since passed away. My nephews would come up and stay when they were small and we’d have such a fun time at Kid’s Cove, the beaches and on our family sailboat Tarka. My parents still visit every summer, so the family traditions continue. My daughter Liz is now at the age where she can go off with her friends and explore the area. They are very fond of Petersen Park and enjoy hammocking along West End Beach. She has started to capture some fabulous images of the area and it’s wonderful to see her own passion and love for the area develop. Loads of memorable experiences have been and continue to be made.